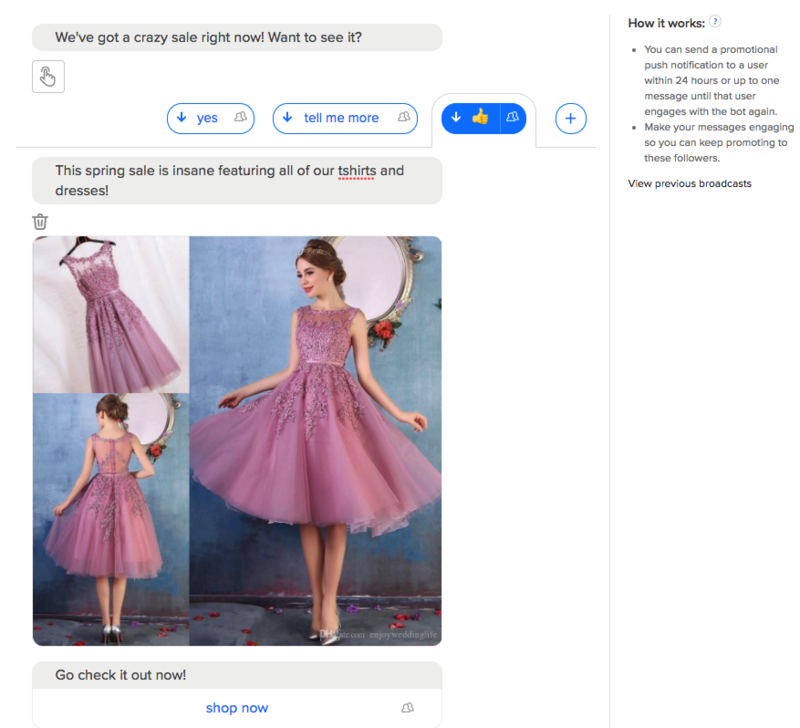 If you are sending a promotional message in your bot, you should use our Promotional Broadcasts campaign to send it. This might include message about a sale, some new products or anything where your intent is for the user to purchase. Promotional broadcasts are limited by Facebook. You can send them within 24 hours of the user first interacting with the bot and one time after that until the user engages again. Once the user does engage with the bot again, they are eligible to be sent another promotional broadcast. What does this mean? Make sure you send engaging messages to your followers! One strategy we've seen work is using subscription updates to send highly engaging updates about news. Then you will be able to message all those engaged users with a promotional update. How do I send a Promotional Broadcast? What are the best practices for sending a promotional message? You can only send one message within the first section of a promotional broadcast because of Facebook's rules. So for instance, you can send text with a button, one image, one video or a carousel but you can't combine them. As soon as you add a reply though, then the user has engaged with the bot and you can send whatever you would like. One the user taps a reply button, you are no longer limited by sending one message at a time so you can set up whatever follow-up you would like with images, video, audio, buttons etc. How do I check broadcast before sending? How do I get more eligible followers to send to? * If you have non-marketing focused material to send like news or something informational, send that through a subscription broadcasts. 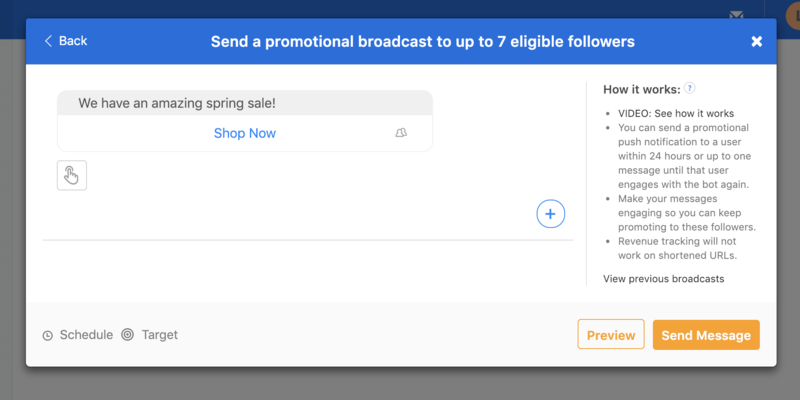 If a user engages with that broadcast, then they are again eligible to send a promotional message to. Definitely make sure that broadcast has engaging replies! Learn about Subscription Broadcasts. *Use our comment capture tool to engage your Facebook fans. Learn more about Facebook comments. * Share a Convo from your Facebook page. Learn how to share a Convo.